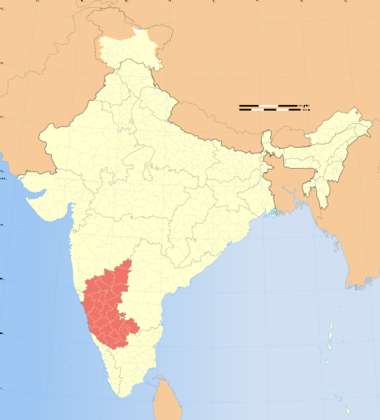 the land of the Kannadigas, is a state in South West India. It was created on 1 November 1956, with the passing of the States Reorganisation Act. Originally known as the State of Mysore, it was renamed Karnataka in 1973. Karnataka is bordered by the Arabian Sea to the west, Goa to the northwest, Maharashtra to the north, Andhra Pradesh to the east, Tamil Nadu to the southeast, and Kerala to the southwest. The state covers an area of 191,976 square kilometres (74,122 sq mi), or 5.83% of the total geographical area of India. It is the eighth largest Indian state by area, the ninth largest by population and comprises 30 districts. Kannada is the official and most widely spoken language, and English is also valid for official use.